The very famous khukri "Historic"; the replica that gurkha soldiers carried and used in World War I-II, gets a new look and new name. We call this Kukri the "Historic Pride" as it has all the famous Gurkha Regiments Cap Badges chemically etched on both side of its blade. 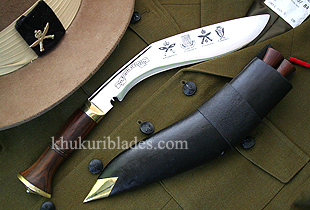 With the symbols of the Brigade Of Gurkhas, this kukri can truly be called the Historic Pride!